August is pretty much the end of the international crop circle season. It’s always interesting to look back and see if any particular formation received more attention then others. Last year the June 6, 2014 “No More War” crop circle, formed in Morse Code in Chilcomb Down near Winchester, Hampshire, United Kingdom, marked the 70th anniversary of the D-Day invasions of 1944. It was a fitting reminder that no war is worth the cost of human life. This year 61 crop circles made the scene, leaving researchers to once again figure out which were man-made circles and which were the real thing (i.e. having possible ET other-world involvement). Unlike prior years, there were more 2015 crop circles popping up in countries outside the usual UK areas. Germany, Russia, France, Holland, Spain, Poland, Czech Republic, Bavaria, Slovakia, Brazil, Norway, and quite a few in Italy made their debuts. Crop circles appear to be going global. One expert researcher in the field, told me that the consciousness of the area definitely affects crop circle formation. Many of the UK farmers are no longer tolerant of people trampling their fields at all hours of the night and day to soak up the “energy”—meanwhile destroying their valuable crop. Consequently, these farmers are more likely to plow their field immediately when one appears and send out a strong “Do Not Disturb My Fields” thought form to the circle makers. It appears to be working. One of the more interesting crop circles of 2015 appeared in Turin, Italy right in the flight path of the Aeroporto Torino on June 23. The intricate crop formation appeared seemingly overnight and has baffled locals and experts alike. It appears to be the real thing. If it were the work of moonlighting pranksters it is estimated it would have taken a team of up to 15 people to etch it out in the space of a night and not be seen by airplanes flying over. Further analysis of the Torino crop formation of June 23rd shows it also contains two small binary codes along its two inner rings. No one has been able to decipher these details. 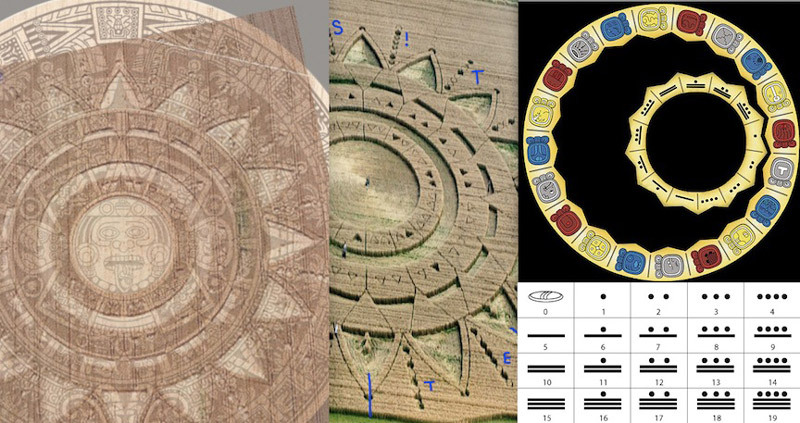 Some suggest these inner marks “may form an alignment with the Aztec Sun Stone, aka the Mayan Calendar.” On the Aztec/Mayan calendar, the stone uses the inner rings to reference dates made up of Mayan glyphs. The question everyone is asking is whether this contains an additional message regarding an upcoming event. At the top of the center of the Sun Stone (called the “Ollin”) is a date – “1 Flint” which means “the distribution of the days.” It is a 260-day calendar, with 20 periods of 13 days used to determine the time of religious and ceremonial events. Each day is numbered from one to thirteen, and then repeated. The day is also given a name (glyph) from a sequence of 20 day names. The calendar repeats itself after each cycle. So, “1 Flint” is the first day of the Flint period in the sacred calendar, which lasts 260 days. The last known “1 Flint” day was December 29, 2014. Adding 260 days to get to the next “1 Flint” day gives September 15, 2015. If you Google September 15th, you have NASA predictions of a comet/meteor/asteroid hitting Earth, Biblical Blood Moons occurring, worldwide economic collapse and even the end of the world. Sounds like an interesting day to watch. From a less hysterical perspective, I was curious to know what was happening in the world around the time this particular crop circle appeared. Had no one considered that the message might be linked to a global event currently taking place? Interestingly enough, the week the crop circle appeared the Greek people were trying to avoid accepting a stringent austerity program being imposed upon them by the IMF and EU. It was predicted that if Greece economically collapsed, other bankrupt countries in the EU would be next—such as Portugal, Italy, Ireland, Greece and Spain (given the unfortunate acronym— the PIIGS nations). Greece is a macrocosm of the microcosm of where the world economy is right now. So “Beware of Greeks bearing gifts” or “Beware of what is coming” might make more sense to the Italian people and the world economically. Italy would be next to face default, since it has the largest government debt in all of Europe ($2.5 trillion). And this would eventually impact all of Europe and then everyone else in a domino effect. I was even surprised to see a financial news article, that came out the week this crop circle appeared, entitled, ‘Timeo Danaos et Dona Ferentes.” Interesting synchronicity. 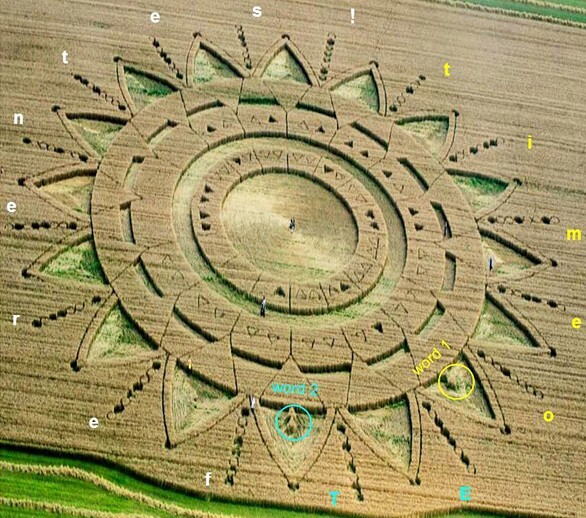 No where in the article was there any mention of the crop circle message. It was a news story about the desperation the Greek people were encountering being cut off from their bank accounts, experiencing food and gas hoarding, bank holiday closings, and resorting to barter since no one was being paid. Everyone was waiting to see whether the Greek government would honor the people’s vote to reject the terms being pushed on them by the Eurogroup, or would they be tricked in the end by their own people in accepting the harsh IMF bailout proposal. Coincidence? Now we know that the Greek government let the Trojan Horse in the country (the IMF banker cabal) and Greece will never be able to fully recover. What are we not being told? This week, Yanis Varoufakis, the former finance minister, said he feared the Greek government would pass new rounds of economic reforms only for the IMF to pull the plug on the program later this year and leave them stranded.”Beware of those bearing false gifts!” is a lesson for the entire economic world to be conscious and take note of. That might be the most pertinent message any crop circle could have imparted to us this year as we all hope for the best for our world economy.